Dreaming of a chameleon can have several meanings. If you see a chameleon changing color: If you dream of a chameleon this suggests your ability to adapt to various situations and be what it is that is required of you in different circumstances. You are able to go with the flow of life and blend in well to any social setting or environment. The chameleon's color: Each color has a specific dream meaning and can be quiet symbolic. 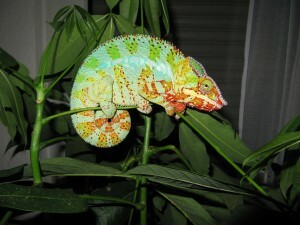 Take note of the color of the chameleon in your dream and further investigate the meaning of that color. If you see a chameleon camouflaged: Chameleons are the masters of camouflage. If you dream of spotting a chameleon trying to camouflage itself this could be a strong indicator that you feel the need to hide some area of your life and that you will be able to sucessfully do so. If you see a chameleon eating: A chameleon's sticky tongue shoots out of its mouth and can stretch up to 1 ½ times the length of it's own body to catch it's prey. If you dream of a chameleon eating, this could indicate that you now have the ability to go after and successfully acquire something that was previously out of reach. If you see the chameleon's tail curled in a spiral: Spirals in general are highly symbolic and signify balance, journey, centeredness, and expansion. Seeing this spiral shape in the chameleon's tail in a dream may indicate that you are developing a greater awareness of yourself and are ready to embark on a path of greater well-being and personal growth.